Desserts are my weakness. But now I don’t eat them very often. I have a piece of dark chocolate occasionally or some berries, maybe even with a little nut butter. But I never really try to make any “healthy” desserts. I save my cupcakes for cheat days thank you very much. If I want a cupcake, I want the REAL THING. But the other day, one of Ryan’s students, who’s a chef, told him to try to make a frozen strawberry merengue since it would be healthy. Of course it being summer and me loving frozen yogurt and ice cream, WE HAD TO TRY IT! I will most definitely never be a food photographer. Slice the strawberries up. While they will get sliced up and mashed further by the blender, you want them small enough to start. Add egg whites and sliced strawberries to a standing mixer or bowl and blend. Keep mixing until stiff peaks form. 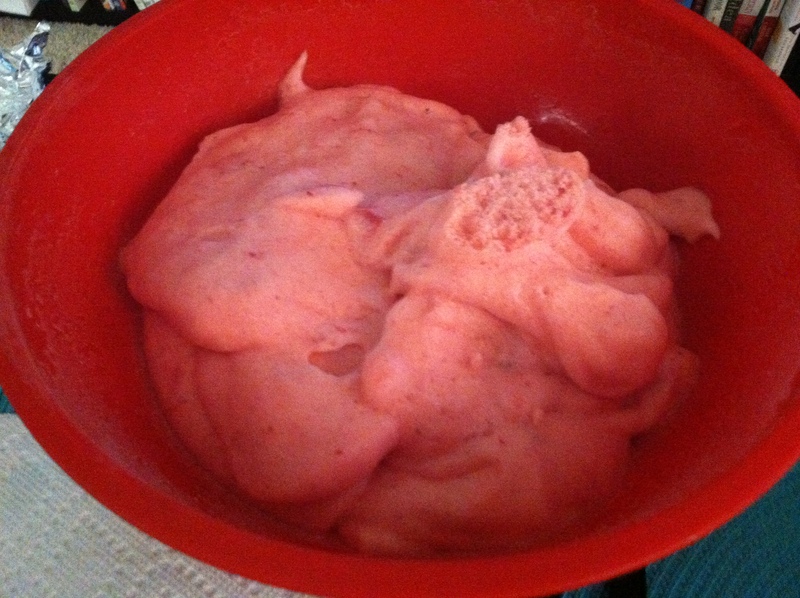 Scoop into a bowl and freeze. The frozen merengue comes out with a fluffy almost snow cone-ish icy texture. It is super good! Obviously this won’t be super sweat unless your strawberries are so you can add sweetener if you want. A great low cal, healthy dessert and perfect for our high carb days since we do lower fat on those days! And since I’m cauliflower obsessed, and love our homemade fried rice as well, I wanted to share this delicious dinner to go along with your dessert! Rice uncooked cauliflower in a food processor and set aside. Season chicken and place in a hot skillet coated with a bit of sesame oil. When chicken is just about cooked, add cauliflower to pan and then add one egg at a time. 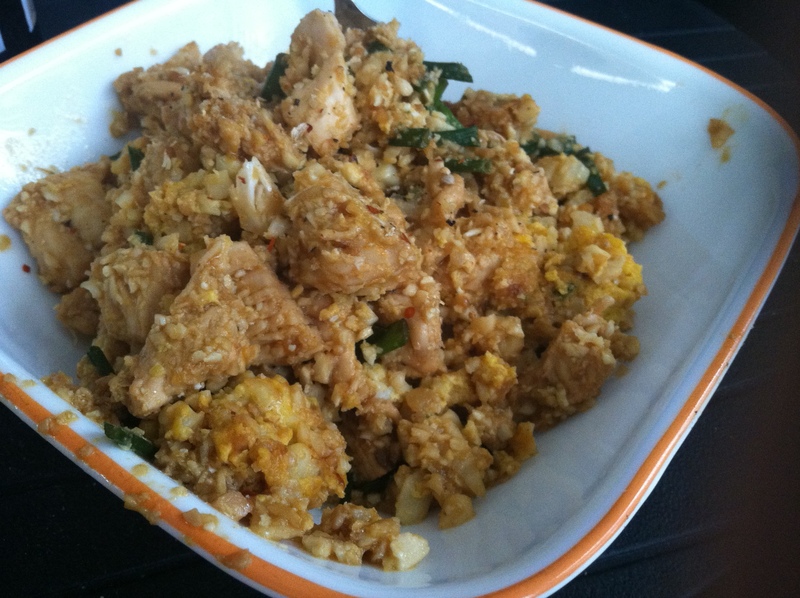 Scramble the eggs in the pan and mix in with the cauliflower and chicken. Serve! And then eat the merengue after…Or along side…Whatever floats your boat! As one of my clients always says about the cauliflower mash, “The cauliflower tastes like CARBS!” So I guess if you are craving carbs (yes…veggies are carbs but I take it to mean starchy or even maybe bad for you carbs) but don’t want to eat them, this and the cauliflower mash are great options! Posted on August 14, 2013, in Diet, Recipe Box and tagged diet recipes, healthy dessert recipe, healthy dinner recipe, whole natural foods. Bookmark the permalink. 6 Comments. I never thought of that type of a dessert, but love fro-yo so this could be fun to try! I don’t get the whole cauliflower rice thing, if I want cauliflower then I just cook cauliflower but the pudding looks amazing, will be trying that tonight. I just love cauliflower in any form. And it is more that I like the texture in the other dishes than that it is a way to even get cauliflower into a dish. To each her own though! 🙂 Let me know what you think of the merengue! 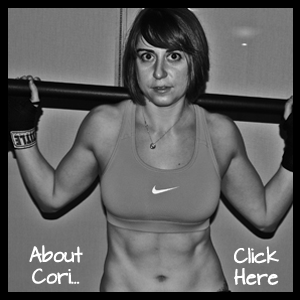 I have a question: You have mentioned high carb days and low carb days a few times in your posts. Does this coincide with whatever workout you do for the day? For example, high carb day on a high cardio day? I cycle my carbs and calories based on my activity level. Your body craves more carbs and calories for that matter when you do more work. Be it a super intense heavy lifting session or a high intensity cardio workout, I will add in more carbs because my body needs it. Sometimes especially active days even require more carbs.